Like any professional team, Porsche spends a considerable amount of time, money and effort on player driver development. As you never know where the next Hurley Haywood will come from, Porsche starts early and developed a motorsport pyramid to help identify and nurture new talent. 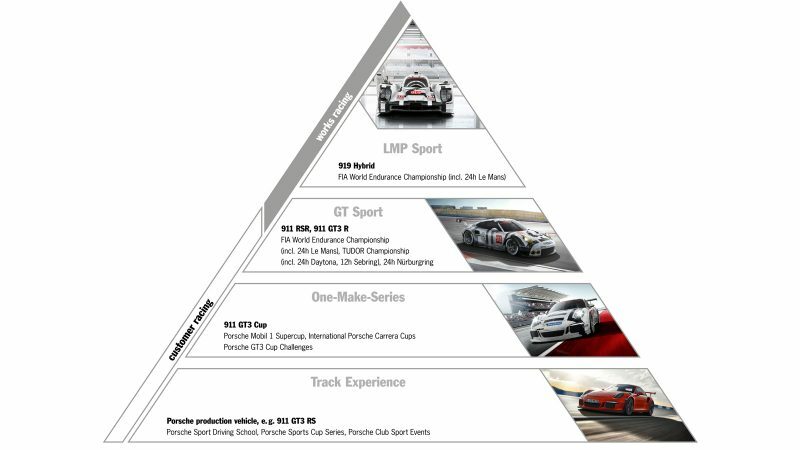 The base of that pyramid starts with Porsche's customers and motorsport driving events like the Porsche Sport Driving School and other Clubsport events (PCA driver's education, POC races, etc.). Next up are the One-Make-Series. These are contested with the 911 GT3 Cup cars in series like the Porsche Mobil 1 Supercup, the International Carrera Cups and Porsche GT3 Cup Challenges. Crossing over from customer racing in the world of factory racing we see 911 RSRs and the 911 GT3 R used in the FIA World Endurance Championship (24 Hours of Le Mans, etc.) and the IMSA Sport Car Championship (24 Hours of Daytona, 12 Hours of Sebring, etc.). Here drivers fight on behalf of both customer teams and factory teams. Lastly, at the top of the pyramid is the pinnacle of Porsche racing. Home to the 919 Hybrid, the LMP1 class is THE top level of FIA WEC racing. Perhaps the best and most recent examples of the Porsche Motorsport Pyramid in action would be Nick Tandy and Earl Bamber. Both came from different Carrera Cups, moving on to GT races and then stepping up into LMP1 and winning at Le Mans. It doesn't get much better than that!